I guess I wasn't sure how involved refurbishing the teak deck and trim was going to be. Typical. I've pretty much been unsure about everything I've done on the boat. Originally, I was just going to fix a few leaks. Sheesh. But, it's been a fantastic learning experience. My teak isn't going to be perfect, but I really do hope it's going to look good and last a long time. 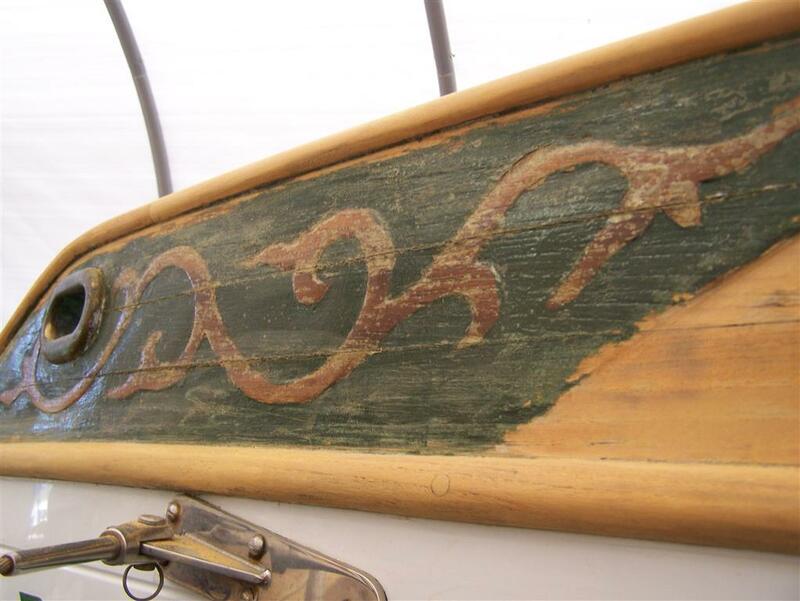 One of my favorite design details on the teak has always been the scrollwork on the bow and stern. On Soñadora, this scrollwork was seriously worn down to the point where you could not make it out. I attempted to enhance it by painting the background green and leaving the area where the scrollwork is natural. Ultimately though, I wanted to somehow bring out the depth as it was when the boat was made. I tried all sorts of tools including a small hand sander and a Dremel (with hundreds of different attachments). None of those were adequate. Then recently, I decided to check out YouTube to see if there were any tips on carving scrollwork. There were many videos showing how to do it and it didn't look all that difficult. So I went out and got a set of chisels from Home Depot and started carving away. It's taken a total of 6 hours or so for me to carve my first scrollwork. It may not be perfect, but I think it will pass the 10 ft. rule (looks good at 10 feet or more). I carved away close to 1/4" of material. That made the screw heads of the screws used to keep the trim in place appear. So I had to remove those and re-sink the holes for the screws. There's only about 1/4" to 3/8" material left, so I don't think anyone will be carving this again. I'll do my best to keep it in shape. This next bit is NSFW - Not Safe For Whiners. 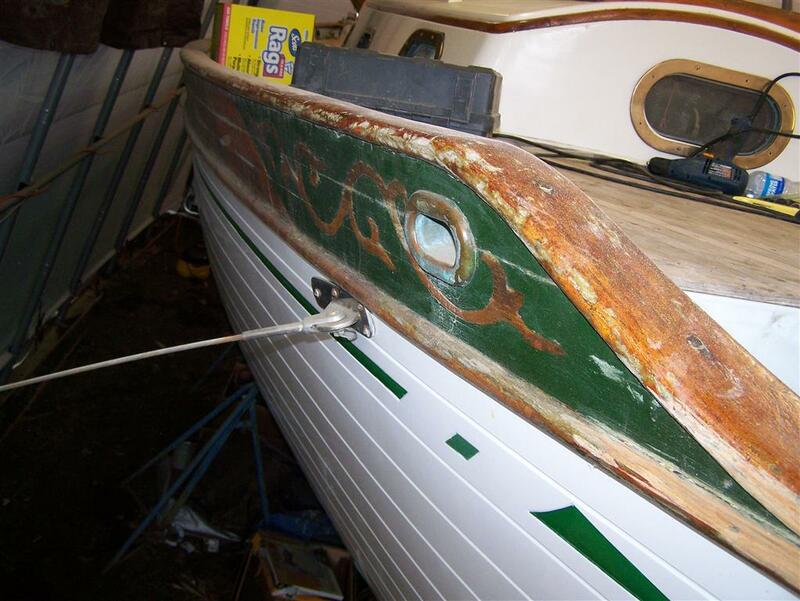 Boat owners who have a lot of brightwork (wood trim) on their boat are a strange lot. 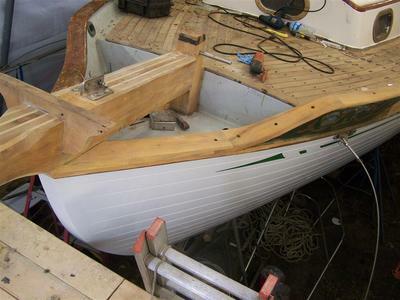 Most sailors, it seems, don't particularly care for all the wood and for the perceived 'labor' involved to maintain it. I will agree that there is a lot of maintenance required, but for those of us who enjoy it, would you still call it 'labor'? To me, nothing looks as beautiful as a boat with finely finished teak or mahogany trim. Our boat has plenty of it. And (for now) I truly don't mind taking care of it as long as I have the time to. The teak on Soñadora was in a pretty sad state. At least as far as I am concerned. I've already taken care of the removable stuff and it looks pretty good. I'm now working on the bulwarks, cap rail and cockpit. The biggest problem is that I never had time to do it right from the get-go. All my varnishing efforts in the past failed because I didn't have the right conditions. It was either raining, or too cold or no time. Now I'm prepping everything as best I can. Then I'll lay on many coats (8-12) of varnish. The hope is that I can do it well enough that I'll only need to lay on another coat of Cetol (yes, I'm going with Cetol). 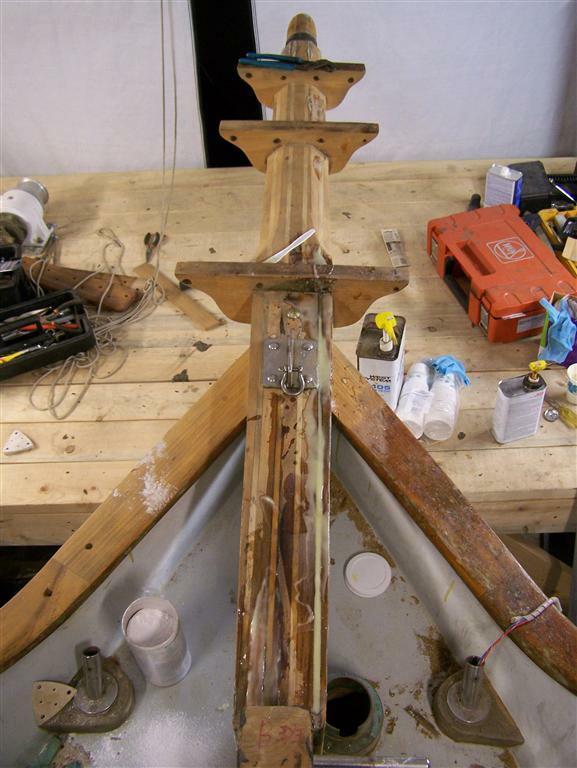 I started first with the bowsprit. 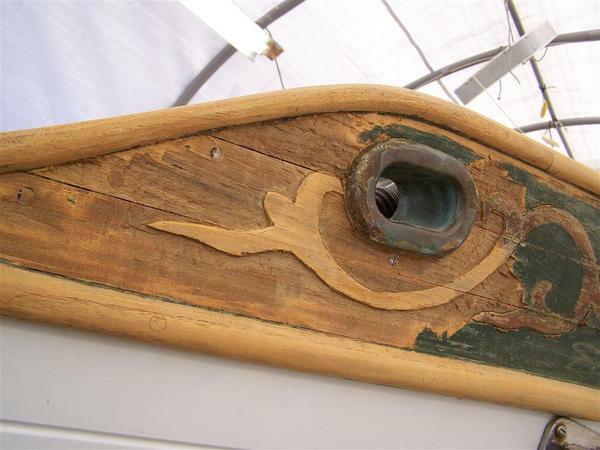 The bowsprit is constructed of alternating layers of teak and a lighter wood, possibly holly but there is discussion it could be some other wood. This 'other wood' is not as durable in the marine environment. It's somewhat sacrificial as it does not provide any structural function. 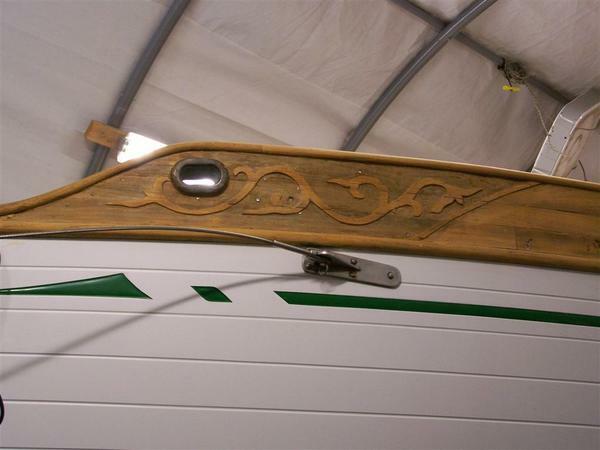 As it is difficult and expensive to carve a bowsprit out of a single hunk of teak, the laminates make it easier to build while providing strength. 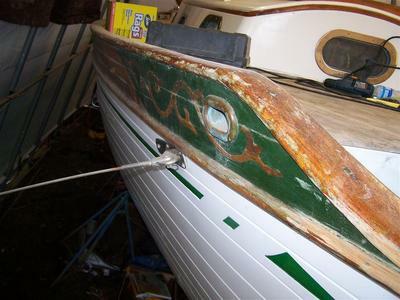 On our boat, one length of this softer wood had significant rot. The ideal thing to do would be to remove the bowsprit and have it professionally refinished. Time and expense would be working against me here, not to mention the impossible-to-reach nut attached to the bolt that is holding the bowsprit in place. I decided to saturate the remaining wood with epoxy resin without any filler. Then I'd fill the remaining void with thickened epoxy resin. Time will tell how well this holds up. Next, I used the DeWalt RO (Random Orbital) disk sander and sanded the flatter parts of the cap rail on the port side. This also included the cockpit coaming. Next I used the Fein with a sanding pad to get the rounded edges and little nooks that I couldn't reach with the DeWalt. There were still some un-reachable spots that even the Fein sanding pad couldn't get to. I decided to attach the contour sanding tool and see if I could get anywhere with that. The reviews of this tool were less than favorable, but I have to say this thing worked wonders! I will try to get some better pics, but this tool made it possible to sand the cleat base without needing to remove the cleat. I don't want to remove any more stuff! I then went to town on the cockpit bulkhead. I still have quite a bit to do before I can even think about applying varnish. Hopefully I can start doing that next week. As always, you can see more at my Baba forum. This page is an archive of entries from April 2012 listed from newest to oldest. March 2012 is the previous archive.